Here's what I'm reading this week (though, technically I read it a few weeks ago, so, I'm re-reading)! 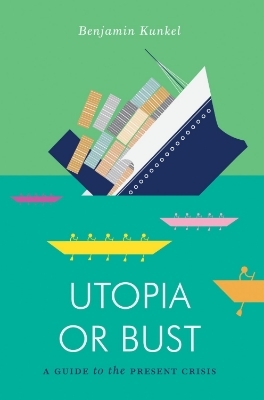 Benjamin Kunkel's Utopia or Bust was not at all what I expected it to be and I'm thrilled about that. I don't want to give anything away because I have a review coming out soon, but let's just say I have SO many questions. Pick up a copy as soon as it's released by Verso on March 11th and let me know what you think in the comments below. The Architecture & Design Film Festival is Finally in LA! We're happy to announce that tickets are now on sale for the inaugural LA edition of the Architecture & Design Film Festival, taking over The Los Angeles Theater Center from March 12-16, 2014! Touching upon one of the festival’s main themes, Clifford Pearson, Deputy Editor of Architectural Record, will moderate a panel on population, scale, urban design, and the ideas of revolutionary city planner Jan Gehl, whose work is featured in the film, The Human Scale. Joining him are Jonathan Ward, architect and partner at NBBJ; Christopher Hawthorne, architecture critic at the Los Angeles Times; and Mina M. Chow, professor at the USC School of Architecture, filmmaker, and principal of design and multi-media firm, mc2 SPACES. Whether designed for a specific project or for mass production, a growing number of architects are leaving an indelible mark on the world of furniture design. Leading this discussion is Frances Anderton, host of KCRW’s DnA: Design and Architecture, who will be joined by Knud Erik Hansen, CEO of the Danish furniture company Carl Hansen & Son, and Barbara Lamprecht, author and architectural historian who was interviewed for the film Coast Modern. Alice Kimm, partner at John Friedman Alice Kimm Architects and professor at USC’s School of Architecture, will moderate a talk on the current state of architectural education with Kevin Kennon, founding principal of United Architects, and others. As a prolific author on modernist architecture and owner of a classic Richard Neutra apartment, Michael Webb will lead this fascinating panel on restoration and the delicate balance between idealism and practicality. He will be joined by actress and preservationist Kelly Lynch, who currently owns Richard Neutra’s Oyler House; Michael Boyd, principal of BoydDesign, a consultancy for the restoration of modernist architecture and collecting modern design; and Frank Escher, partner at Escher Gune Wardena Architecture and an expert on John Lautner. Mimi Zeiger, critic, curator and founder of the popular architecture zine loud paper, will present a panel on community and design/build with Steve Badanes, director of the Neighborhood Design Build Studio at the University of Washington, and Dave Sellers, architect and co-creator of the utopian Prickly Mountain enclave in Vermont. Please find more information in the attached press release. We're happy to provide film stills and screeners, or connect you with any of the filmmakers and festival curators if you're interested! We're also able to offer comp tickets to all of the films on a first-come, first-served basis for our media friends-- so look over the film schedule and let us know if you'd like to reserve tickets for any specific screenings. This photo is from UAM's Facebook page, it is not my own. There are just two months left to check out Materials & Applications: Building Something (Beyond) Beautiful, Projects 2002 – 2013 at the University Art Museum. The exhibition runs from January 25 – April 13, 2014. While you're there, check out MatterApp: Pyramidial (MA:P), the project I worked on with CSULB's DESN 360A students, assistant professor Heather Barker and the UAM. I chronicled the progression of MA:P through the fall semester on the UAM's tumblr but you can also see my photographs (some not shown on the blog) alongside student renderings and prototypes in the exhibition. Plus, I wrote some of the wall text so that's cool, right? MA:P is slated to be built on campus, behind the pyramid, sometime in the near future so stay tuned for details on that. I'll be there to document it all if I can help it. On a another note, Traditions Transfigured: The Noh Masks of Bidou Yamaguchi is also on display at the UAM until April 13th.